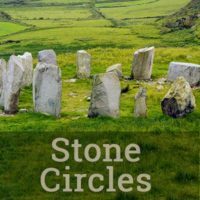 Drag within the image to explore eight of the Loughcrew cairns in virtual reality, beginning at the entrance to Cairn T. An interactive map will appear when you click the button to enter full-screen mode. Touch here for the tablet version. 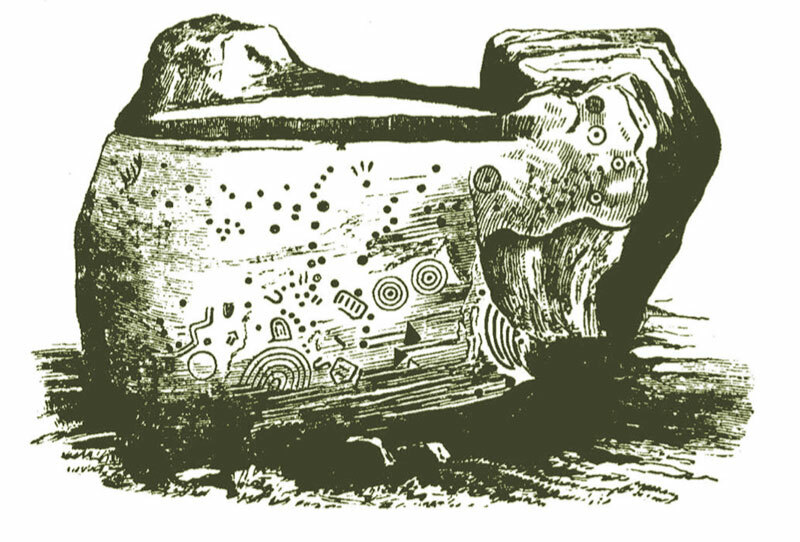 Stone basin in Cairn L Recess. 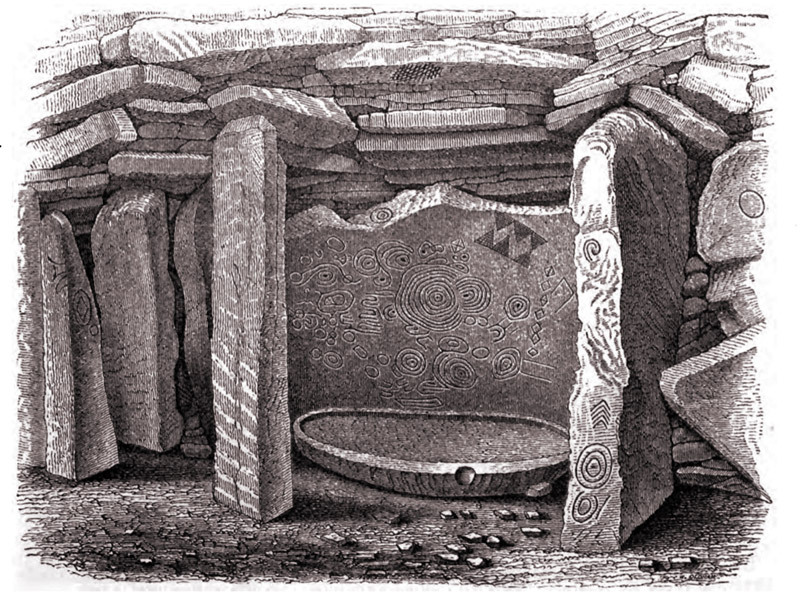 (Eugene Conwell, 1873) See the interior of Cairn L in the virtual-reality tour (above). Sliabh na Caillíghe constitutes a Neolithic necropolis, a passage-tomb cemetery with some evidence of at least thirty tombs, the grandest concentration of such monuments in Ireland. Over the centuries scores of others may have been destroyed with no trace remaining. 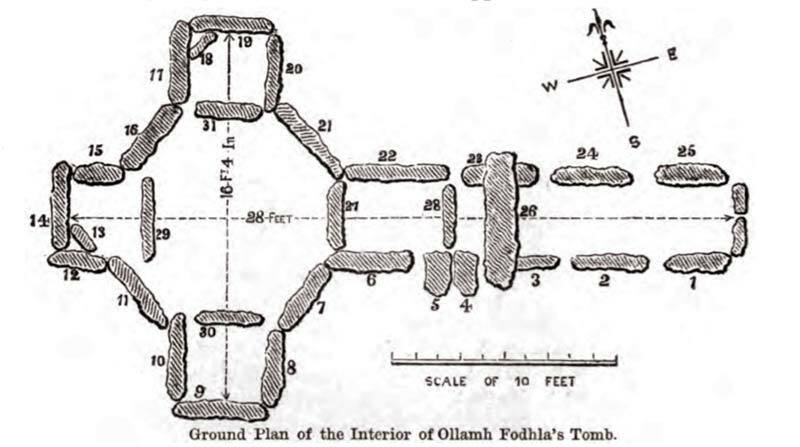 Today many of the structures are present only in outline form, their covering cairns—tons of stone—deemed fair game for construction projects before the site was taken under the protection of the state.4 Some of the remaining tombs contain lavishly decorated orthostats, with engravings whose meanings have eluded archaeologists and inspired much earnest speculation. 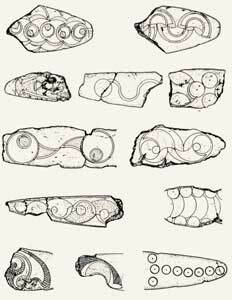 One ruined tomb, Cairn H, contained stunning evidence of its having acquired a new purpose sometime in the Iron Age: hundreds of elaborated incised bone fragments in the characteristic La Tène style (see illustration bottom right, and in the gallery). 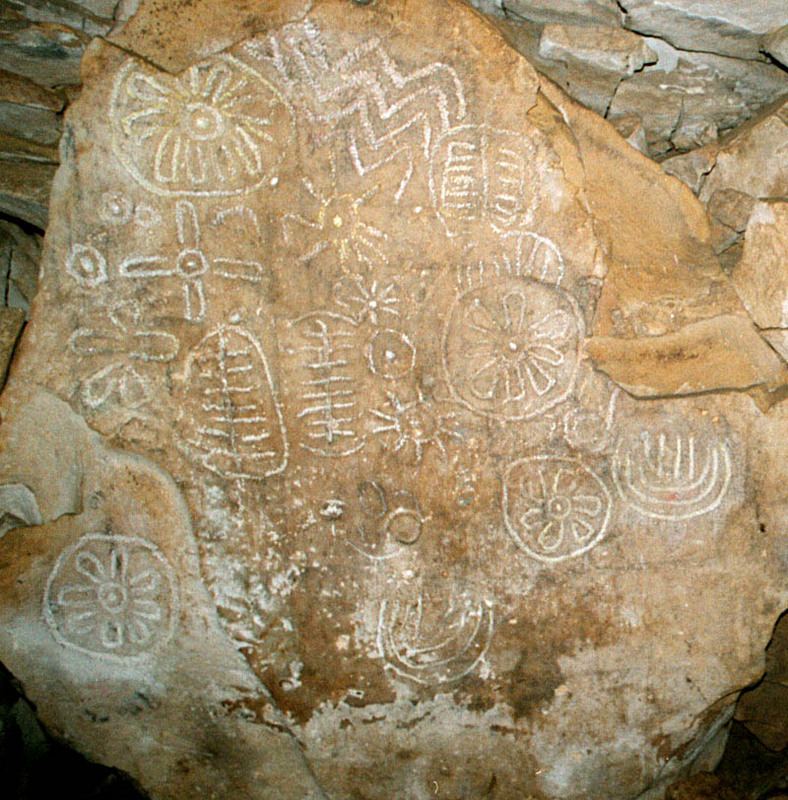 Some of the cairns have never been fully excavated and may yet contain hidden chambers. 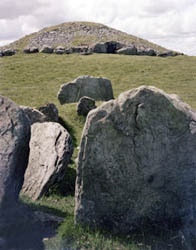 The two hills in the townland of Loughcrew are named Carnbane (White Cairn) East and Carnbane West. 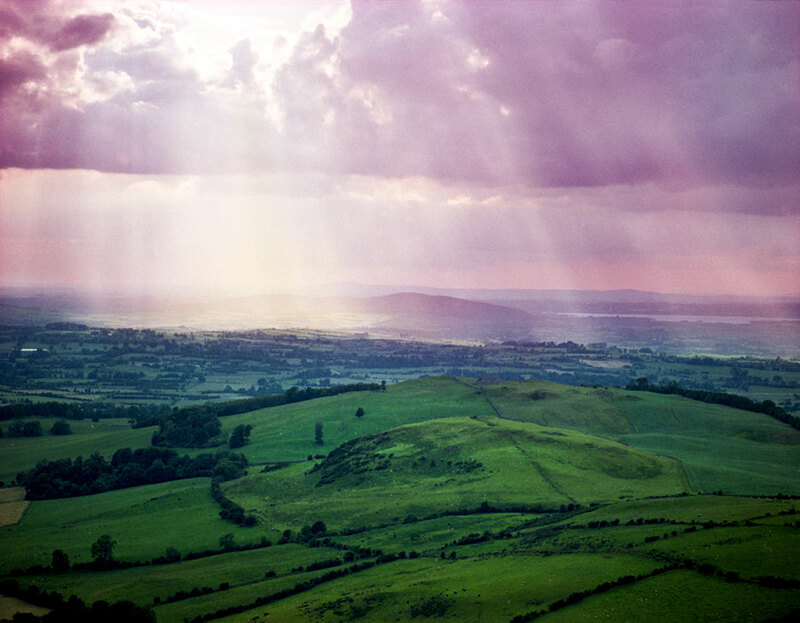 The third hill of the Sliabh na Caillíghe legend lies in the townland of Patrickstown. 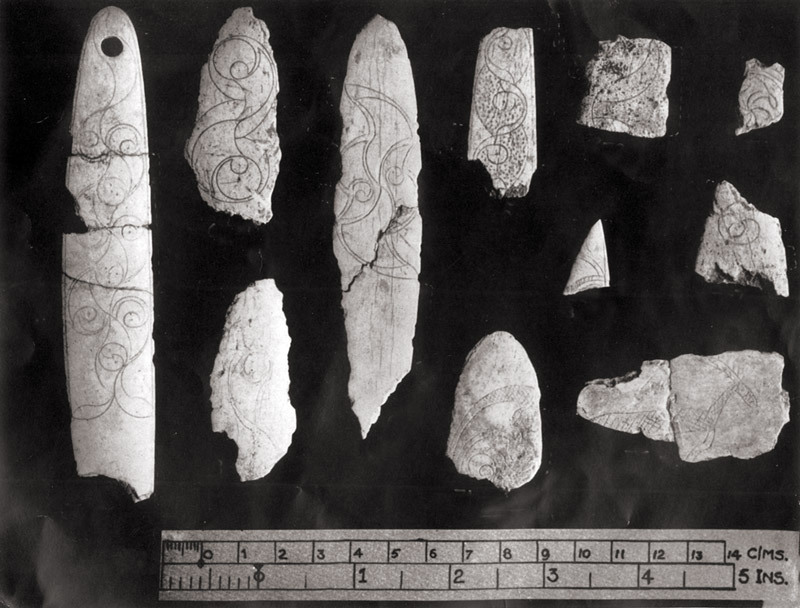 Its cairns are entirely demolished, with just a few kerbstones to mark their locations, and a single decorated stone (below, left) remaining from the central cist of Cairn X1. If venturing out for an actual tour of the monuments during the summer months, the visitor will find Carnbane East easily accessible by a winding footpath up the hill. Cairn T, on its summit, may be freely explored; no queue for tickets as at Newgrange, Ireland’s most visited passage tomb 40 km (25 mi) to the east.5 The monuments on Carnbane West however are off limits, the landowner disallowing any public access.6 However in our virtual-reality tour both of the Loughcrew hills may be visited (top left), and nine of the monuments explored in panoramic detail. The most extensive VR exploration is of Cairn T on Carnbane East,7 which allows entry into the deepest recess of the tomb. Cairn L on the western hill may also be entered in virtual reality. Please note that the interactive map visible when the scene is viewed in full-screen mode is not drawn to scale.8 There is also a version of the tour optimized for use in a head-mounted display (HMD), such as Google Cardboard or Oculus Rift, available here. Learn more about HMD VR here. 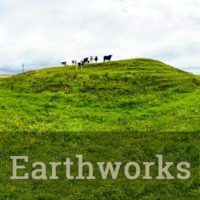 Aside from our photographic virtual-reality tour, modern digital scanning and mapping technologies have enabled an interactive model of the exterior of Cairn T.
The two principal hills of Loughcrew have a total of 22 monuments remaining. Carnbane East, with Cairn T preserved and partially reconstructed in the 1960s, dominates its 275 m (904 ft) summit. Six ruined satellite chambered tombs surround it. 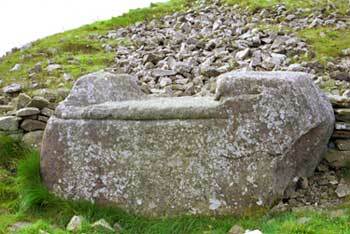 Carnbane West holds 15 monuments, the largest being Cairn D (55 m or 180 ft in circumference) and Cairn L (45 m or 148 ft). The largest monument, Cairn D, was effectively vandalized in the 19th century during futile efforts to discover a chamber. 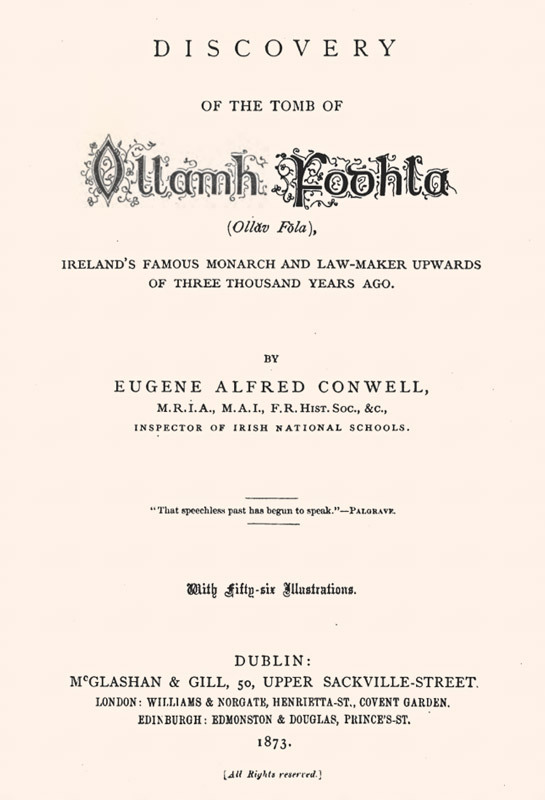 It is astonishing, given its geographic prominence and the extent of its monuments, that John O’Donovan and the other meticulous investigators of the Ordnance Survey in the 1830s gave but scant attention to Sliabh na Caillíghe.9 Eugene A. Conwell undertook the first thorough exploration and mapping of the hilltops after he happened upon them during a picnic with his wife in 1863. 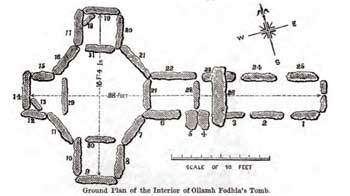 Conwell proceeded in the next few years to thoroughly explore the tombs, conducting extensive excavations—unscientific by modern standards—with the assistance of the landowner. 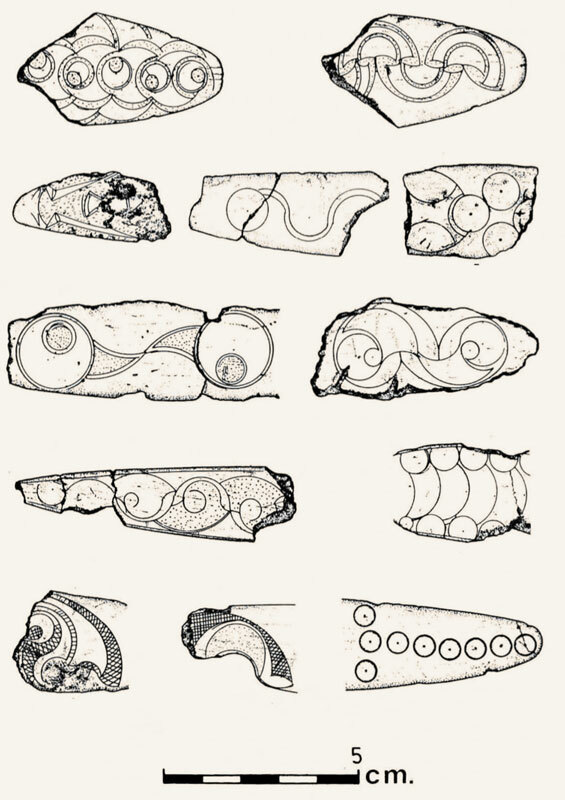 His use of the letters of the alphabet to designate the different cairns remains the nomenclature today. Some of Conwell’s observations are included below for the nine different monuments explored in our virtual-reality tour. Additional information has been gleaned from Jean McMann’s 1993 guide and from Martin Byrne’s website. 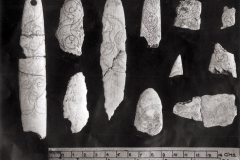 Today’s archaeologists are grateful that Conwell engaged an artist, G.V. 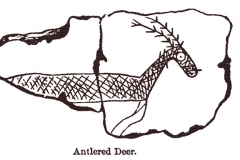 Du Noyer, to make accurate paintings of the wealth of megalithic art in the tombs. 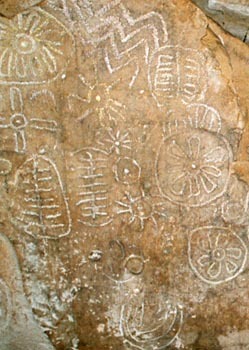 These elaborate pictographs, once Conwell’s workers removed their cocoon of debris and exposed them to the elements, soon began to deteriorate. A sample of Du Noyer’s paintings may be noted, above left, and in the gallery. 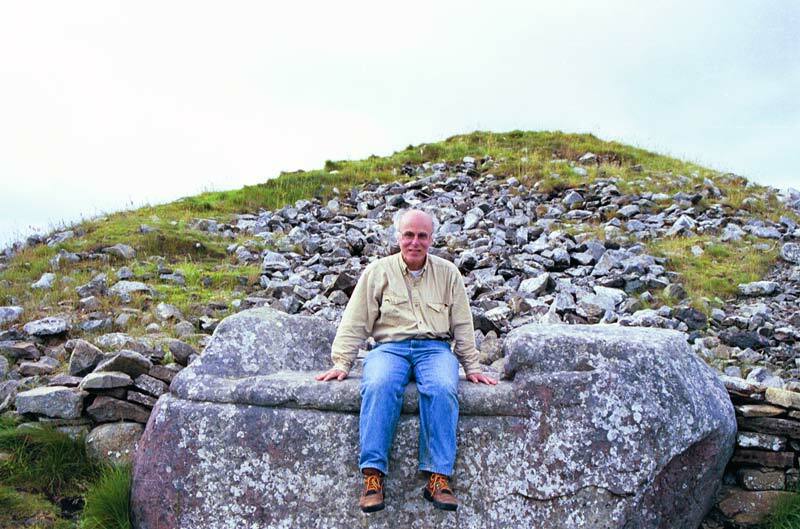 Conwell, in the decade following his pioneering Loughcrew fieldwork, deviated from his careful observation and entered into the murky realm of fable-based speculation. In an endeavor to fit the monuments into the prevailing synthetic history of Ireland, he grandly suggested that Loughcrew was the site of the games of ancient Tailteann, even though the ceremonial mound in the townland of Teltown, 19 km (12 mi) away, was, and is today, generally considered the historical location of the games.11 Conwell also proposed that the throne-shaped stone at the side of Cairn T was where the great “law-giver king” of Irish legend, Ollamh Fodhla, first promulgated his legal code. 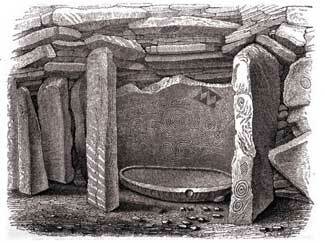 Conwell further insisted that the ashes inside the cairn were the mortal remains of this monarch and lawgiver. 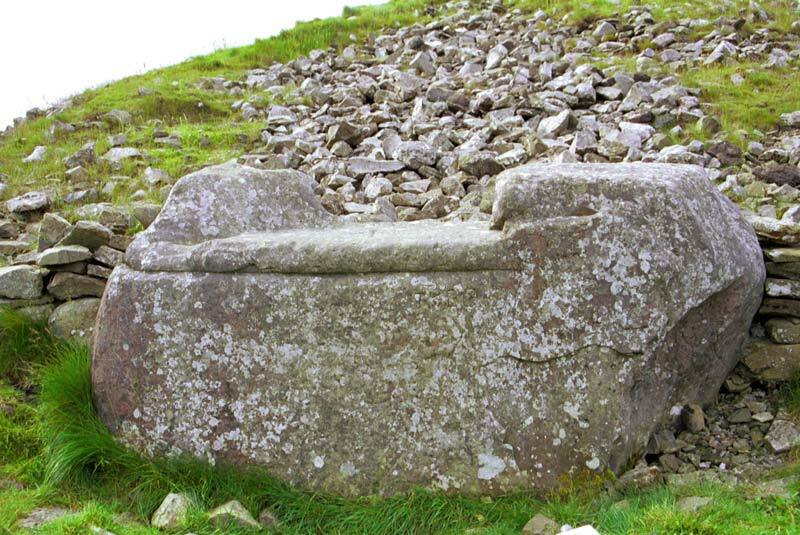 The throne-shaped stone is labeled “Hag’s Chair” in our VR tour. 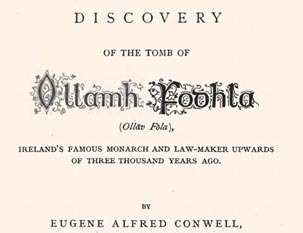 Conwell’s publications in the 1870s promoted his theory that Loughcrew was the site of the legendary Tailteann. 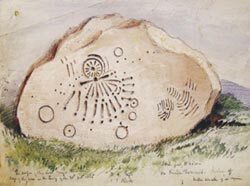 The extravagant megalithic art found on the backstone of the passage into Cairn T on Carnbane East may be viewed in our VR tour either by a beam of natural light or by artificial (strobe) light. Martin Brennan discovered in 1980 that this stone is positioned so that on the vernal and autumnal equinoxes the rising sun casts its light onto the intricate designs etched by the ancient builders.15 On those days, just before the dawn light enters the passage, the tomb, which is normally locked at that hour, is opened for visitors eager to climb up the hill in the cold darkness and share the phenomenon. Photographs of the equinox sunrise may be seen here and here. A video of the phenomenon, courtesy of Boyne Valley Tours, may be seen near the bottom left of this page. 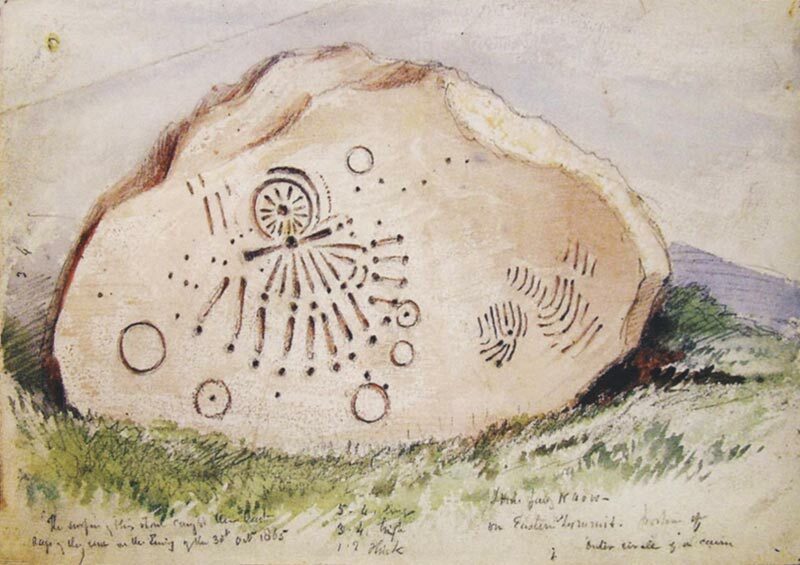 Even though Alfred Conwell’s bold assertions regarding the historical lineage of Cairn T welled up primarily from his own imagination, his explanation of the monument’s pedigree soon became a modern addendum to the folklore of the site.16 But Conwell’s contribution overlaid indigenous legends that may have already existed for a thousand years. Click to view in full resolution. 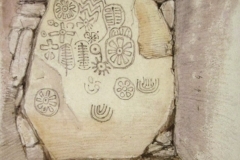 Legends of An Cailleach Bhéara are not unique to the Loughcrew Hills. 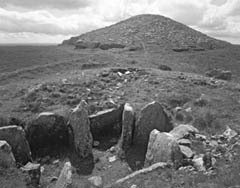 She also figures prominently in the folklore of the passage tomb on the summit of Slieve Gullion, 64 k (40 mi) to the northeast in Co. Armagh. The Hag of Beare stories originated in the Beara Peninsula of Co. Cork, where, at Coulagh Bay, a natural rock is pointed out as her petrified face. 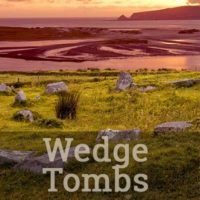 Also in Co. Cork the Labbacallee Wedge Tomb is said to be her burial site. As a sovereignty queen, she was given the personal names of Buí, or Digdi. 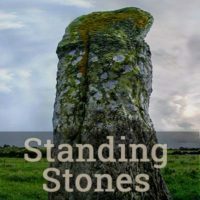 In a very real sense, An Cailleach Bhéara acted as an Earth Mother, a supernatural figure who was a fundamental “creator and presider over the landscape.”19 In addition to dropping cairns on mountaintops, she also was responsible for placing large boulders in rivers, and sculpting rock formations on hillsides. Her geotectonic powers extended to creating islands in the seas, and transforming lakes into mountains. For An Cailleach Bhéara, her longevity evokes a sense of awe, but also a sadness stemming from the fragility of old age. Eugene Conwell’s plan (1873) showing the passage into Cairn T.
Perhaps the saddest, and most evocative, of all the texts associated with the Hag of Beare are the verses of “The Lament of the Old Woman of Beare,” dating in different forms from as early as the ninth century. 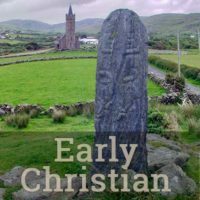 It has been called “one of the most remarkable poems which medieval Ireland produced.27 In this poem, An Cailleach Bhéara is a fabled creature of the distant past, once able to renew her power from the endless forces of nature, but now faced with the pitiful degradation afforded old women in a new patriarchal society. Even though, in some translations, she is depicted as having gladly taken a nun’s veil, she still mourns for the life, and youth, she has left behind. in the old days, my lost days. should they come. I have no love. as I am, and they still hold. Hartnett’s translation may be read in its entirety in the footnote. A 1994 translation by Anthony Weir, illustrated with his photographs, may be viewed here. Other translations include those by Kuno Meyer (1899), Lady Gregory (1919), and Gerard Murphy (1952). Pádraic Pearse’s patriotic evocation of the Hag figure, “Mise Éire,” will be familiar to most Irish schoolchildren. 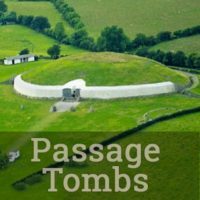 The Loughcrew Passage Tomb Complex is one of the main megalithic cemeteries found on a line stretching west to east across the middle of the country from Knocknarea and Carrowmore near the Sligo coast to the fabled Brú na Bóinne tombs a bit farther to the east in Co. Meath. 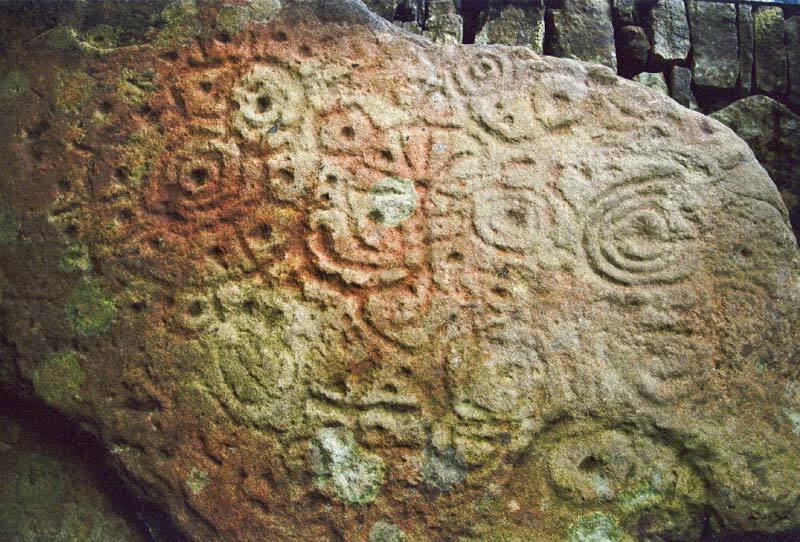 The nine Loughcrew monuments explored in our virtual-reality tour are described below. 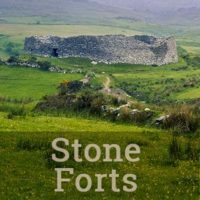 There are five sites to explore on Carnbane East and four on Carnbane West. 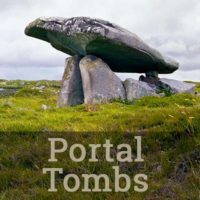 Three of the passage tombs may be entered on the VR tour: the partially restored Cairns T and L, and the ruined Cairn H.
Cairn T is the principal monument of the entire Loughcrew complex, sitting on its summit, the highest point in Co. Meath. 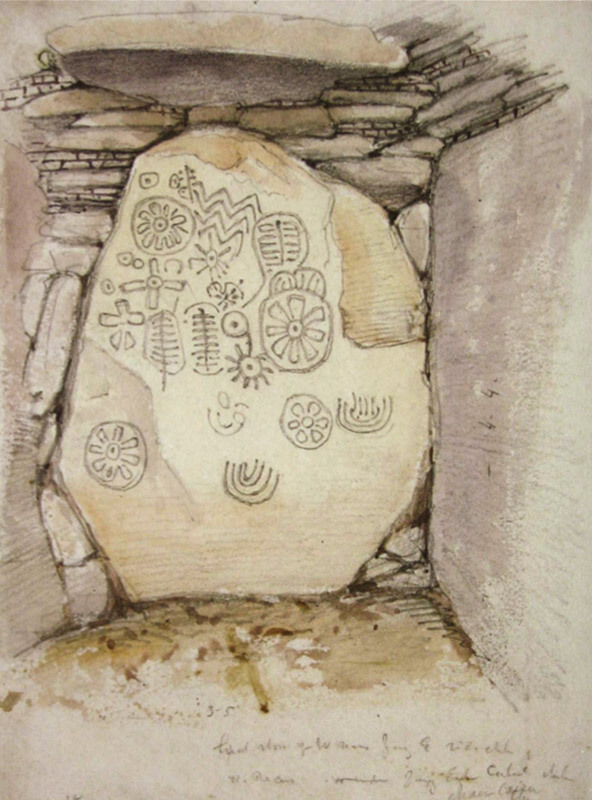 Known as “The Hag’s Cairn,” it features a treasure-trove of megalithic art on its decorated orthostats, and 360° views over 18 counties from the top of the passage tomb. In our VR tour, the view from the top of the cairn is where a hotspot connecting to Carnbane West is found. The mound is 35 m (115 ft) in diameter, with an 8.8 m (29 ft) passageway from its entrance to the backstone of its inner chamber. 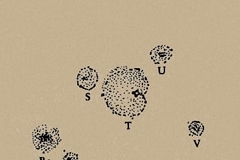 The passage may be explored in detail, with hotspots at four different positions. The final hotspot is at the cruciform 3 m- (10 ft-) high inner chamber with its corbelled roof and three side recesses, each with its own corbelling. A kerbstone just within the northern periphery of Cairn T, the Hag’s Chair is a massive block with imposing armrests carved from the stone. It is 3 m (10 ft) long and 1.8 m (6 ft) high, with an estimated weight of 10 tons. 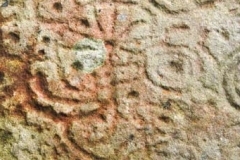 Its carvings, now much degraded, may be seen in the illustration in the gallery. A deeply-incised cross carved into its seat was noted by Conwell as a nineteenth-century trigonometric mark, although others have claimed it to be an artifact of the monument’s use as a “Mass rock” during Penal times.31 Conwell is also responsible for creating the enduring legend that considers this rock to be the throne of the mythical lawgiver-king Ollamh Fodhla.32 The earlier tales, of An Cailleach Bhéara, suggested that she sat on this chair and looked out over her domain. Local lore states that a modern visitor, seated on the chair, will be granted a single wish. 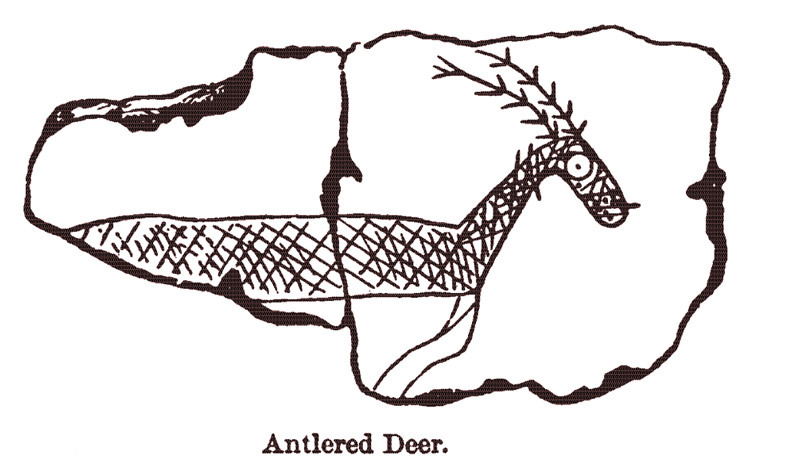 When Conwell excavated the ruined Cairns S in the 1860s he discovered “a perfect specimen of a leaf-shaped arrowhead,” as well as a passage “filled up to the height of eighteen inches with charred bones.” The chamber features six ornamented stones and a round kerb of 35 boulders, 17 m (56 ft) in diameter. Please note that the monuments of Carnbane West are on private property and unfortunately not now (2013) accessible to the public. Furthermore, the entry to Cairn L is closed by a locked iron gate. Our virtual-reality tour includes the monuments on this hill by special arrangements with the concerned parties. 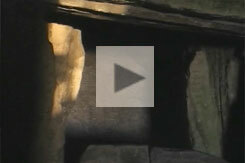 The progress of the sunbeam on the backstone of Cairn T was recorded at sunrise on March 23rd, 2005. The 50 minute video has been compressed here to 1 minute.